The swim will begin with a running beach start. As with all beach starts, this will involve a combination of dolphin diving and swimming as you move towards the first marker buoy. Competitors should turn left around this first buoy and swim parallel to the shore. At the final marker buoy, competitors should turn left again and swim towards the beach. From the beach competitors should follow the exit chute to transition. National Series and Super Series transitions are located on different sides of the beach exit chute. Listen for directions from the race marshals, and make sure you follow the correct direction at the top of the exit chute. 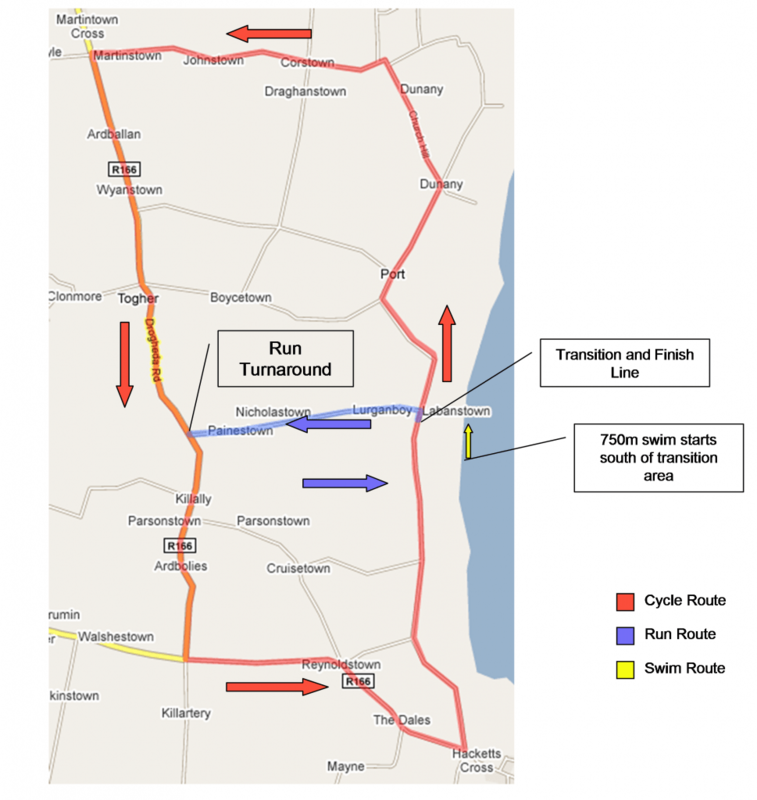 Competitors will exit transition and head north along the coast road for a 20 km loop. This brings them back into transition along the coast road from the South. This is a flat course through lovely countryside with a maximum elevation of 50 m. All junctions are left turns. The cycle route will be entirely on closed roads. However, we remind competitors that the rules of the road still apply and that a closed road may still have some local traffic on it. Competitors will exit transition and run along a closed road for 2.4 km. At the turnaround point, change direction and run back along the same road, for another 2.4 km to the finish line. There is a slight climb from sea level to about 30m elevation at the turning point which means the last half is a nice downhill to the finish.